With Neh’Mind just days away, people are already starting to receive pre-orders and hear snippets of the songs on sites like Amazon, so we HAD to address one of the sickest tracks on the EP, “Get Throw’d“. “Get Throw’d” is the party anthem of Krizz’s latest EP with the 816 Boyz in full effect, and production by Iowa State Defensive Lineman Jake McDonough AKA JMAC. Y’all might remember not long ago we spotlighted JMAC’s work with the 816 Boyz on the updated Iowa State fight song “Comin’ Thru“. Well it seems JMAC is becoming a regular selection among frequent Strange collaborators, so we caught up with him to discuss “Get Throw’d” and his Strange experiences. You recently produced a track for your university that featured Tech N9ne and the 816 Boyz. Was that the first time you’ve produced a track for a big name artist like that? Yeah, kinda. The first real big track that I did was for E.B.A.H., and then they ended up helping me out. It was kind of a summer-long deal that we worked on for the school song and Makzilla gave me some ideas on what to do with the song. I found the beat and then got together with the ISU drum line, and then Makzilla said it was missing something, so then I got a guitarist that goes to our school named Tyler Mock and got him on the track to help out with filling in that missing gap in the beat and then we ended up getting that done. I sent it over to Makzilla, then all the rest of the 816 Boyz got on it and they killed it! Well they’re like my second family, y’know? I got linked up with Tech through his uncle. I was working security at a local Krizz Kaliko concert and I was working that event and was talking to his uncle for a while, and we exchanged numbers and kept in contact with each other. Then I met Makzilla and he became like my “little big brother.” He’s like a mentor to me. We’ve been in contact ever since then and Makzilla’s been helping me with my beats and stuff like that and I’ve been hanging around with those guys quite a bit and finally they started to hear some of my stuff and they were like, “Okay we didn’t know you could do it like that Jake!”, and then it was on. If you had to pick between going to the NFL and becoming a full-time producer, which would you pick? I’d have to say the NFL. Because this is just a hobby right now, and it’s something I like to do with my spare time and… y’know whenever I have the free time, I love to make my music. But my first and foremost goal is to make it to the NFL. What team would you choose if you could pick any team? Have these opportunities with Strange Music opened the door to any more music with notable artists? Not yet, but I could see it happening down the road. 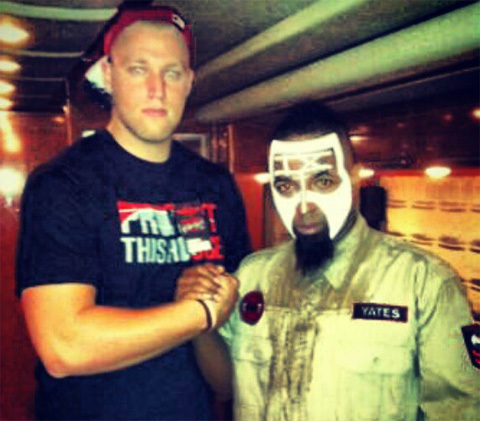 I know that Tech N9ne is a big name and he’s friends with a lot of big name people too, so I wouldn’t be surprised it if it opened the door. Really it’s just a great opportunity working with Tech, Mak, Krizz and Kutty. It’s just an honor working with those guys and it’s been a blessing. They’re awesome, they’re all down to earth, and like I said they’re like my family away from home, so it’s real cool just to work with them. But if other opportunities present themselves, I’d be more than willing to take them. Dope. Now how did your collaboration with Krizz come about on Neh’Mind? He had reached out to me asking if I had any beats. He was looking for some dub-step, heavy bass type stuff. He was looking for some futuristic sound, he was looking for something crazy and I was actually already working on making some beats for him and I had just made one probably two days before he reached out to me and I was like, “I might just have the perfect one for you.” I sent that over and he was like, “Oh yeah I gotta get this one,” so then he took it and he made a hit out of it! That beat was crazy, I wanted to mix in the club sounds with almost like the southern-heavy, bass-type sound. I would say Seven and Young Fyre because those guys…I’ve been a huge Strange Music fan ever since I can remember, and just being able to work with Strange has been amazing. And listening to K.O.D. when Young Fyre was producing all those tracks, it inspired me to start making beats, and then listening to what Seven’s been creating – it’s just been making me want to step my game up even more. He’s ridiculous man. Now would you say “Get Throw’d” is the kind of track you would use to get hyped before a game? Yeah I would say so, because that kind of upbeat song and the way it flows, you can’t help but get pumped up by it. It depends on what I hear in my head, really. Sometimes I’ll hear a melody and I’ll go in and make that real quick and then I’ll form all the drums and everything around that, or some other times I’ll have a drum pattern in my head and I’ll work on a melody around that. What do you think it is about the 816 Boyz that make people love them so much? I think the main thing people like about them is, y’know they just bring a party to every song, and they always seem to have that fun music. People love to hear their music when they’re together because they’re four great artists individually, and when they come together it’s a piece of art. I know you’ve been getting a lot of opportunities from Strange Music artists, would you ever consider producing an entire 816 Boyz EP? Click here to pre-order your SIGNED copy of Neh’Mind. Have you heard Get Throw’d yet? What did you think? Would you want to hear a full 816 Boyz project?